I often think about what brought my family to America originally. My German and Welsh heritage, somewhere in the past, decided opportunity awaited them across the sea. Some genealogy on my German side is known, however, my Welsh side mysteriously dead-ends somewhere a few generations back. There's quite of bit of irony in the realization that I am, more or less, negating their intentions of casting themselves out from their homelands to become something new.If they were alive today, I'm certain they'd either laugh hysterical, or attempt a painful and violent session of torture to bring me around. 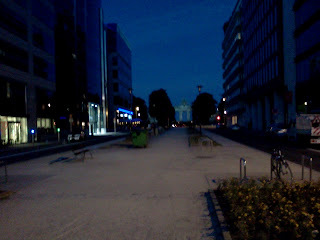 However, it's too late, here I am, in my new world: Belgium. Though we tend to think of the world smaller today, and true, my journey to arrive here only lasted eight hours on a vessel traveling just under Mach 1, any attempts from my imagined, heckling ancestors in my head are quickly subdued with the happiness that I'm right here, right now. I had hoped for a degenesis and I'm going through nothing less than that. You can try to anticipate, and wish for true adventure to happen, but I have a feeling that most people who claim such efforts are often unaware of the ever-lurking truth- that true adventure doesn't come by intensity, accomplishment, or absurdness, it comes from failure, slowly, ever changing you over time- from one moment to another, a silent whisper in your ear that you don't realize is there till you look back in a day or a week, before you smile and realize that you're no longer her. The poem I wrote called Departure I think best describes this process. I think I died the moment I got on that plane. Not biologically, but by the act of departure, I had set in motion a series of events that will eventually bring about something so wonderful, I can't wait to see what I become. Of course, that's the hard part. Knowing you have the capability to be something greater than you are now, but knowing that it only comes when you least expect it. So now I set out for this new world on an ocean of uncertainty, not knowing the destination but beguiled with wonder and so ever happy to have set sail.